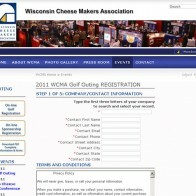 WisCheeseMakersAssn.org - Amplitude Design, Inc.
Amplitude Design, Inc. worked with the Wisconsin Cheese Makers Association to develop a web strategy for four of their largest events as well as their www.wischeesemakers.org web site. We would love to hear from you about some of your ideas. Click here to contact us.